When auditing a website's search engine optimization (SEO) efforts, it's easy to find issues that need to be addressed but we can use this data to discover new opportunities, as well. SEO audits are generally conducted to evaluate the status of, and identify any issues with, a website’s technical setup, content, linking and overall organic search performance. However, an audit should do more than this. It should enable you to discover growth opportunities — and it should help you to prioritize your SEO actions based on how critical they are and the level of impact they will have. Sometimes, huge opportunities are not identified — and thus not recommended to be prioritized in the SEO process — because key questions about the elements assessed and/or data gathered during the audit haven’t been asked. 1. Which Pages That Are Not Meant To Be Indexed Or Ranked Are Wasting Your Site Crawl Budget? Let’s start with a fundamental issue that I still see every single time I do an audit: Wasting a site crawl budget. This is usually the result of keeping links to error pages, redirected pages, canonicalized pages or non-indexable pages active. This issue is especially common on sites that have gone through a migration or redesign. Even if former URLs were redirected, sometimes internal links pointing to the old URLs are never updated, causing many internal redirects; in other cases, the initially implemented redirects are eliminated, causing the crawling of now non-existent pages. In other situations, wasted crawl budget occurs as a results of massive use of canonical tags and meta robots noindex tags to treat content duplication issues (especially with some CMSs automatically including those). The canonical and noindex tags are generally effective in fixing content duplication issues; nonetheless, if these pages are still internally linked, they will end up sometimes eating your crawl budget, as in the example below. The goal should be to make the most out of the search crawler effort in your site, prioritizing the discovery of those pages which are important and meant to be ranked. You can use SEO crawlers like Screaming Frog, OnPage.org or Deepcrawl to easily answer this question. 2. Which Of The Highest Visibility Pages Are Canonicalized Or Redirected? Another common issue I find is that relatively well-ranked pages are now being 301-redirected or canonicalized toward other pages; the rankings are not always completely lost, but their performance is not as good as it could be if they were the canonical version. If the now-canonical page is the one that is supposed to rank, then it’s important to improve the signals toward it and eliminate any links going to the old non-canonical ranked pages. To identify this issue, you can go to the Google Search Consoles and select the “pages” filter from the Search Analytics report. This will provide you with a list of the pages with the highest organic search visibility, which you can export as CSV, then import into Screaming Frog and crawl using the “Upload List” mode. This will give you the http status codes of these pages and show you if they are canonicalized. 3. Which Of Your Best-Ranked Pages & Query Combinations Have A Low CTR Or High Bounce Rate? It’s a must to review your top-ranked pages and identify any performance issues that end up hurting their organic search conversions, such as a low click-through rate (CTR) from search results or a high bounce rate. Low CTR can be common when the pages ranking for some queries are not the ones intended (due to content cannibalization problems) or when there’s a non-optimized or incorrect title or meta description shown, providing a poor user experience in the search results pages. High bounce rates can occur when there are page speed problems, content issues (not enough relevant information or a mismatch from user query) or a lack of mobile optimization. These issues also result in a bad user experience, causing visitors to leave the page instead of continuing with their customer journey. You should first export the top visibility pages from the Google Search Console Search Analytics report to crawl in Screaming Frog. From there, use URL Profiler (you can directly import the Screaming Frog file) to integrate the required Google Search Console and Analytics data, as well as Google’s page speed and mobile validation through their API. At the end, you’ll have an Excel sheet with all of the necessary data in one place (as shown in the image above), which will facilitate the required analysis to answer this question. 4. Which Of Your Most Visited & Best Converting Pages Have Speed Performance Issues? 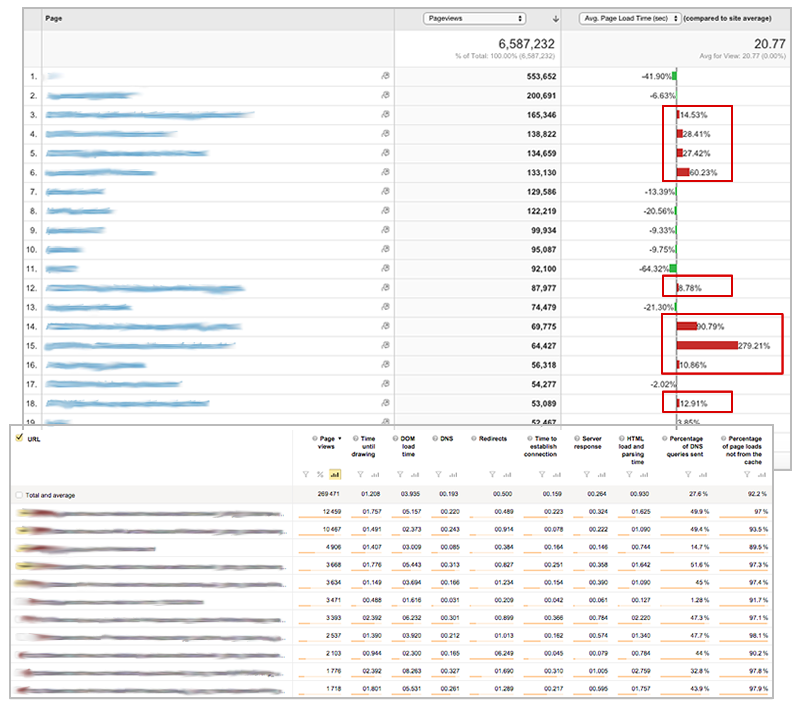 I recommend digging deeper with your page speed analysis. In addition to looking at potential issues with the best ranking pages, it’s important to find out if any of your most visited and best converting pages suffer from speed problems, as well. Google Analytics has Site Speed reports where you can directly check which pages have the highest page views and higher-than-average load time. Among these reports is a “speed suggestions” report that integrates with PageSpeed Insights, giving you the average load time for your top pages, along with a link to the PageSpeed suggestions to get recommendations for improvement. 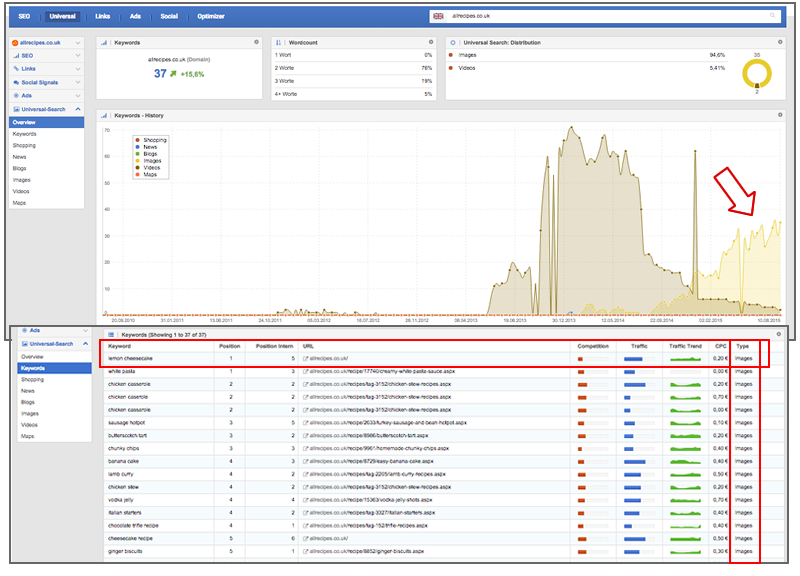 Yandex Metrica also offers a page load time report that includes a wealth of page-speed-related information, including DOM load time, server response, HTML load and parsing time, time to establish connection and more. These data can help you to identify potential site speed issues. Of course, you can further the analysis by exporting data from Google Analytics about your most visited and best converting pages, crawling them with Screaming Frog, then again using URL Profiler to import them and validate their mobile and desktop speed. 5. Which High-Traffic Queries Are Your Competitors Ranking For In Mobile Search That You Aren’t? SEO audits often include some form of competitive analysis; however, this is often limited to desktop search only, despite the fact that Google surfaces different results on mobile. Due to the increasing importance of mobile search (and especially in light of Google’s recent mobile friendly algorithm update, aka “Mobilegeddon”), it’s time to take this competitive analysis to the next step by making sure you’re maximizing your mobile presence (both Web and app). You can start by identifying which queries your competitors’ mobile sites and apps are already ranking for and profiting from that you’re still not targeting. This can be done using SEMrush, which provides mobile search data for the US, or Sistrix, which provides this data — along with the level of competition, potential traffic and trends — for the US, UK, Germany, France, Spain, Italy, the Netherlands and more. Sistrix also shows which pages specifically are ranking in mobile search results, and at which positions. A similar analysis can be done to identify the potentially missed opportunities with mobile app search (especially when implementing mobile app indexing) using Similar Web app analysis to check the percentage of traffic brought from search engines to your top competitors’ apps, as well as the keywords bringing it. You can compare this data with yours to identify the existing gap and mobile search growth opportunities. 6. Which Of Your Organic Landing Pages Are Not Internally Linked Or Only Found In XML Sitemaps? Sometimes your most important, meant-to-be-ranked pages are not being prioritized in your internal linking structure due to website architecture issues (especially common after a redesign or site migration processes). In the most extreme cases, these pages wind up as “orphan pages” that can’t be found through normal Web crawling. Some SEO crawler tools, such as DeepCrawl or OnPage.org, allow you to integrate your XML sitemaps and Google Analytics landing pages; they will crawl the pages found there and inform you if they are included only in these places that haven’t been found in the Web crawl. The screenshot below shows OnPage.org’s orphaned pages report. 7. Which Verticals Can Provide More Search Visibility Opportunities Through Universal Search Results? 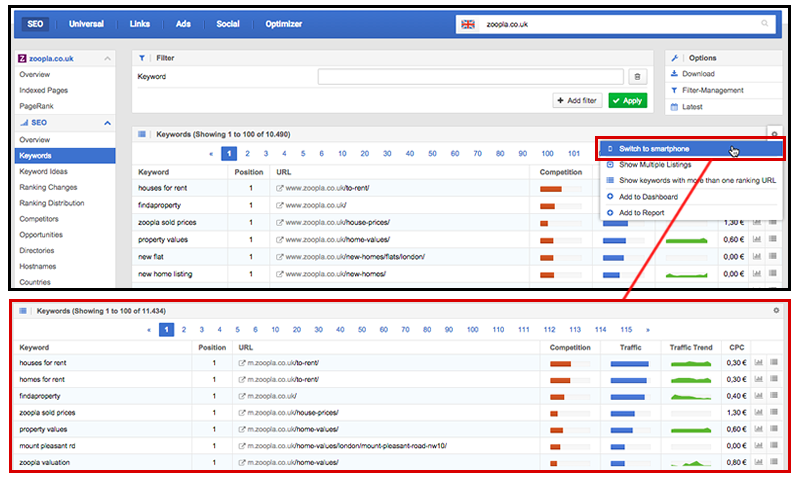 It’s also common in SEO audits to check if you’re ranking with the right pages and formats. You can identify potential opportunities to grow your organic search traffic by creating and optimizing content in different formats for Google’s universal search results, depending on your vertical; for example, localized or geotargeted sectors may wish to pursue maps results, and e-commerce sites may wish to pursue visibility within images results. 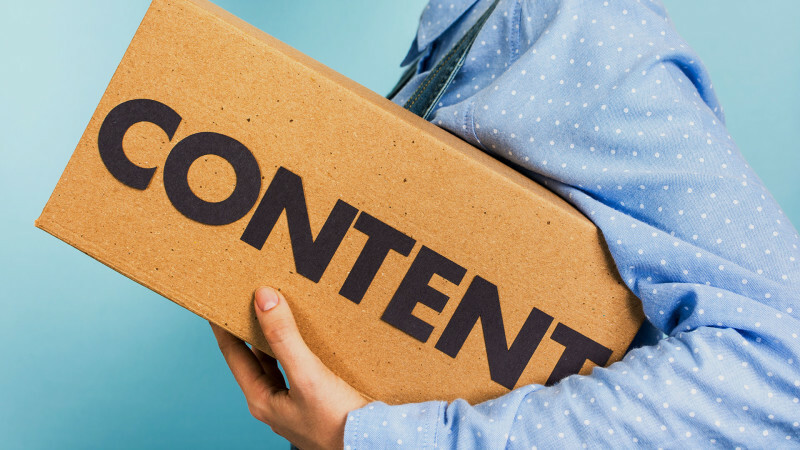 By identifying these opportunities, you’ll be able to prioritize the development of multi-format content to maximize its impact. 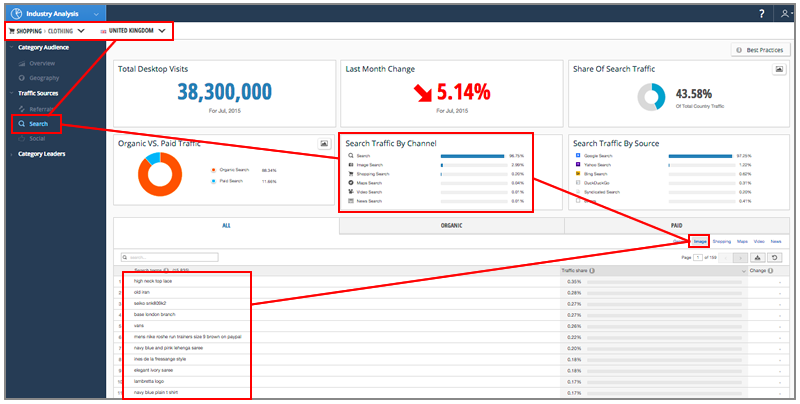 You can start by checking with Similar Web’s Industry Analysis, selecting your desired industry and country, then verifying in the “Search” report the percentage of traffic sent by each channel, as well as the keywords sending more traffic per channels. 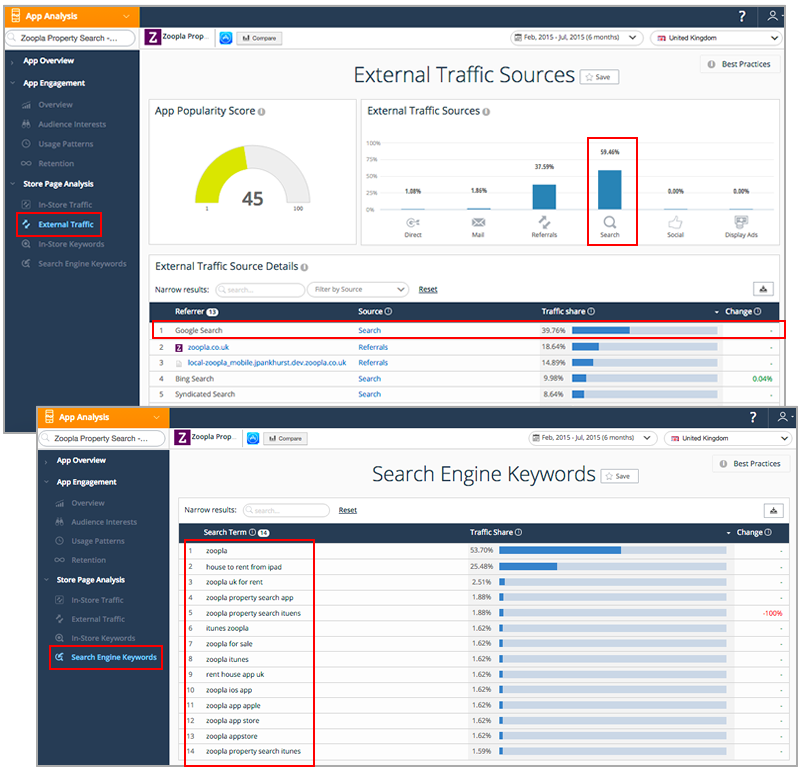 You can additionally identify and complete these keywords by using Sistrix’s “Universal Search” module to check your industry top players’ and competitors’ universal search visibility profiles. This view will provide information on search traffic sent by each vertical over time, as well as the keywords, position and pages they’re ranking with.